The Siniawan Night Market in Bau, Malaysia is in layman’s term, a “Foodie Market”. Filled with stalls of delicious local food, its charm is hard to resist. It is recommended that you go a little early, as the crowd starts filling the market as well as the parking lot around 7 pm. Apart from the items for your taste-buds, you can also treat yourself to small souvenirs. Weekends have the reputation for offering the most delectable spread, so if you’re in the city during the weekend, this market is a must-visit. Another exclusive activity that you can enjoy here is karaoke. Don’t miss out on this feast! 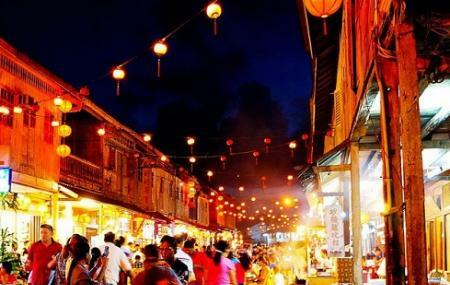 Use Bau trip planner to visit Siniawan Night Market and many others to your visit. Add comfortable hotels to your plan, choose from the recommended hotels in Bau like De Dango. Explore the best Bau vacation packages that will take to you important landmarks of the city! For getting in, check out how to reach Bau. Love this? Explore the entire list of places to visit in Bau before you plan your trip. Fancy a good night's sleep after a tiring day? Check out where to stay in Bau and book an accommodation of your choice. How popular is Siniawan Night Market? People normally club together Sarawak Orchid Garden and Fairy Caves while planning their visit to Siniawan Night Market. Nice place to visit during weekends. Foods are okay and there are varieties of them. Nearby Buddhist temple adds to the overall image of an old town culture/lifestyle that has been preserved well until today. If one is nearby it is worth a visit but I wouldn't suggest to drive 20 minutes to get there as we did. In fairness we were aware that on Sunday (when we visited) was really quiet. Although the food is good and it is a scenic road. Lots of variety of local food, and it's cheap. Tasty too, and the atmosphere is invariably Sarawakian - it's mix of all the different cultures all in one place. Parking is a problem though. Siniawan Night Market comes to live on Fridays, Saturdays and Sunday evenings. The Main Street in town is closed to traffic n open to food stalls and visitors and customers who come in for the live music n the food. The place comes alive with colours n aromas on evenings with good weather. Getting there takes half an hour or so from town by car but part of the roads are not street lighted and the turn-off is not well displayed after dark. I was informed Cowboy Nights are worth visiting. Unfortunately my timing was not spot on.